Lab finishing refers to the process used to insure the accuracy of the propeller rake angle, pitch, progression, pitch variation and cup. This hand process involves thinning the blades and sharpening the leading edges. Blueprinting refers to the process used to ensure the accuracy of the propeller rake angle, pitch, progression, pitch variation, and cup. This hand process involves thinning the blades and sharpening the leading edges. The advantage of blueprinting is that it reduces the horsepower required to turn the propeller and generates more usable horsepower for thrust. On an accurate, well-built propeller the speed gain may be 2-3 miles per hour. On a lesser quality propeller, the increase may be 3-4 miles per hour. This is where I will add pitch or down pitch by 1 inch. A repitch will change the RPMs by 200. Ventilation occurs when air from the water's surface or exhaust gases from the exhaust outlet are drawn into the propeller blades. The normal water load is reduced and the propeller over-revs, losing much of its thrust. This action most often occurs in turns, particularly when trying to plane in a sharp turn or with an excessively trimmed-out engine or drive unit. Ventilation can also be caused by aerated water from step bottom hulls. As a shape passes through water at an increasing speed, the pressure that holds the water to the sides and back of the shape is lowered. Depending upon the water temperature, when the pressure reaches a sufficiently low level, boiling (i.e., the formation of water vapor) will begin. The collapsing action, or implosion, of the bubbles releases energy that chips away at the blades, causing a "cavitation burn" or erosion of the metal. The initial cause of the low pressure may be nicks in the leading edge, too much cup, sharp leading edge corners, improper polishing, or, sometimes, poor blade design. Massive cavitation by itself is rare, and it usually is caused by a propeller that is severely bent or has had its blade tips broken off resulting in a propeller that is far too small in diameter for the engine. What is the Mark’s Props process? Fill out and submit a work order. Pack your propeller and be sure to include a printed copy of your work order. Ship the box to us. Expect a call from SaVonna. When we have completed the requested service, we'll call you to collect payment information. Be on the look out for your finished propeller. We'll ship it back to you so that you can get back on the water in no time. What does a repair include? This is putting your propeller back to the factory specifications, welding all missing blades, and balancing. How should I maintain my propeller? Essential to good propeller maintenance is periodic inspection to detect even small dings, which can lead to blade failure if not dressed or repaired. A damaged propeller, even one that only appears slightly damaged by running through silt and sand, can significantly reduce performance efficiency and fuel economy, and can more severely damage itself through cavitation erosion emanating from the blades' irregular leading edges. In one test with a damaged propeller, top speed fell more than 13%. Acceleration was off over 37%. Optimum cruise miles slowed 21%. Worse yet, damage usually is not done to each blade uniformly and, therefore, the damage can set up imbalance vibrations that can cause fatigue damage to other parts of the engine or drive. If you boat in shallow or rocky waters, you will want to check your propeller more frequently for possible damage. How do I measure the distance between pad to prop shaft? Where can I go to get more information about boats and boat propellers? 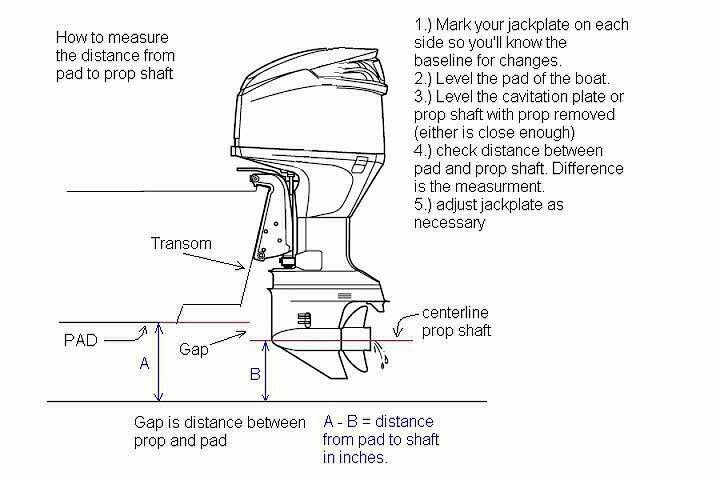 For all of your propeller questions, check out the forums at BassBoat Central.